This is a great project for new sewers to learn some basic skills. It might be a little boring but there are awesome children’s fabrics out there which would look great as a pillow on your bed or crib. 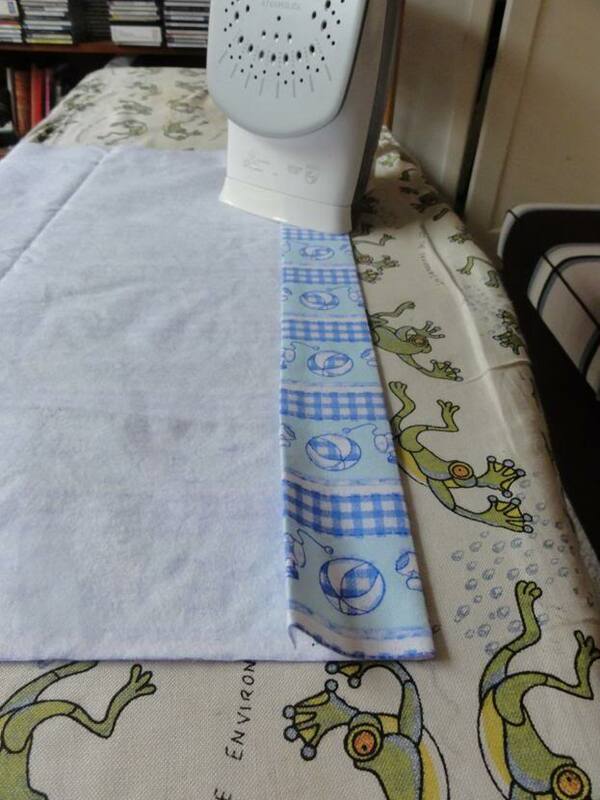 If you haven’t sewed before I recommend you try this as it will take you through most of the skills you will need for harder projects. I will give you the directions for a standard-sized pillow. In this guide, I am using a contrasting thread so you can see what I am doing. You will probably do better with a matching thread color. 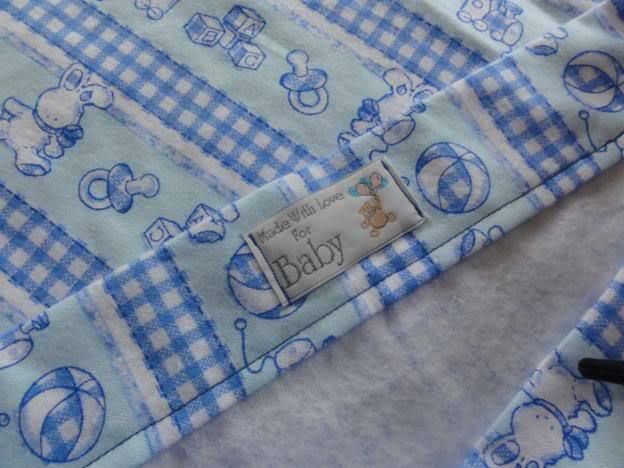 1 metre of fabric – poly cotton or flannelette in a cute print. 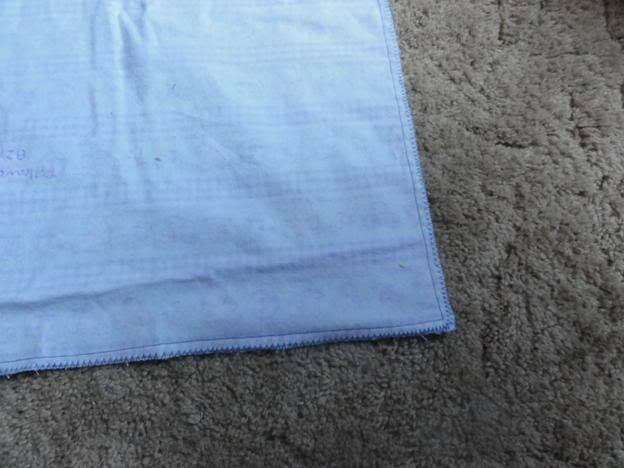 Wash, dry and press your fabric. This will preshrink it. It is advisable to wash any fabric prior to sewing it. This includes a 1 cm seam allowance. You might wonder why I do not just cut from one side, using the funny stabilized edge running down the side of the fabric roll. The reason is that this 'selvedge' has different properties to the rest of the material and stretches and shrinks in a different manner to the rest of the fabric. 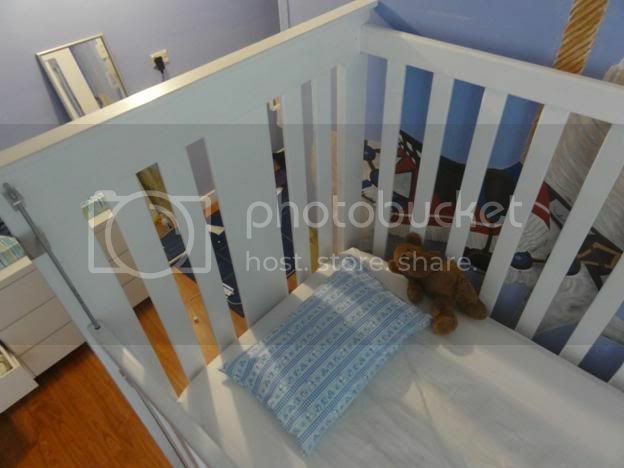 Put your front pattern piece down, good side down. 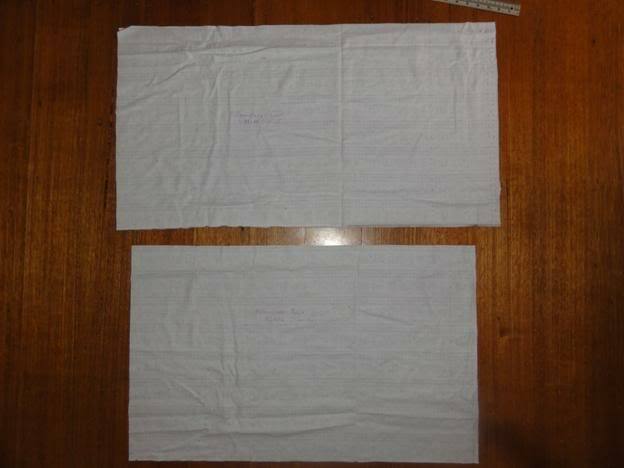 At the short side fold over one cm and iron down, fold over a further 5 cm hem. Press the hem down and pin it in place with dress makers pins across the direction of the hem. Now sew down the hem. With the piece pattern side down, and the folded hem in your right hand, put the back, right-hand corner of the piece under the presser foot. Lower the presser foot with the needle about 5 mm onto the fabric. Make sure both threads feed away from you. Gently stitch 2 or 3 forward stitches, then put your machine in reverse and stitch back over your first stitches for 2 or 3 stitches. This process locks your seam and prevents it from pulling out under stress. 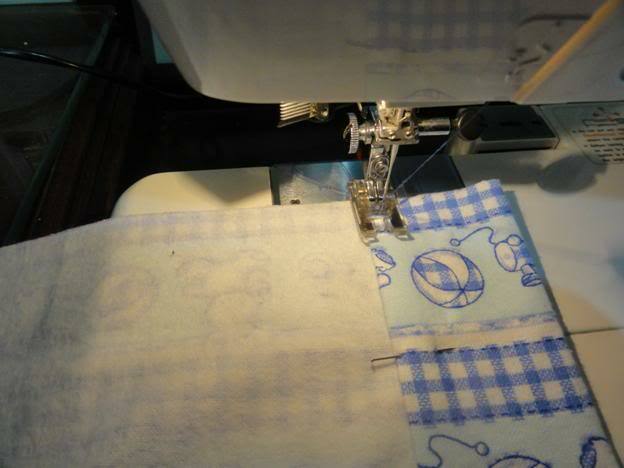 Now return to forwards and start to sew your first line of stitching. 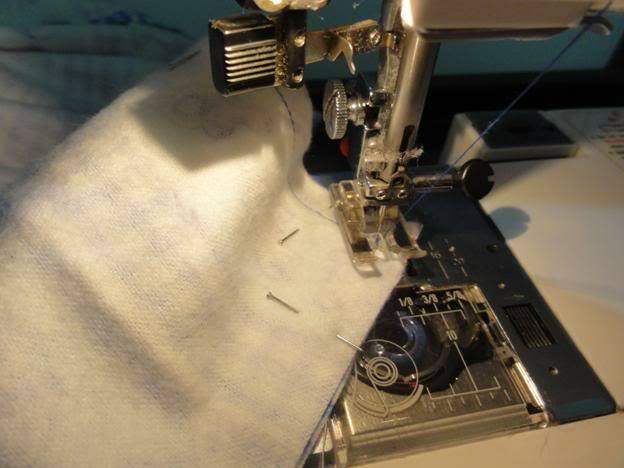 It is possible to sew over pins placed at right angles to your stitching, but I strongly recommend that you don’t. It tends to make a slight ragged stitching line and there is always the chance of blunting, or worse, breaking a needle. So as you come to a pin, stop the machine and remove the pin. Continue in this manner to the other end of the hem. Lock this end of stitching with 2 or 3 reverse stitches. Take your foot off the pedal. Lift the needle and lift the presser foot. Pull the material out away from you and cut the threads. A hint: don’t cut the threads too close to your needle, leave about 10 cm of both threads and leave them hanging out to the rear of the machine ready for your next seam. Trim the dangle threads at both ends of your seam. Step 5: Hem the Front (Larger) Piece. Step 6: Sew the Pieces Together. This is the big one. Put the front piece down, good side UP. Carefully put the back piece on top, good side down, carefully matching the unsewn edges. 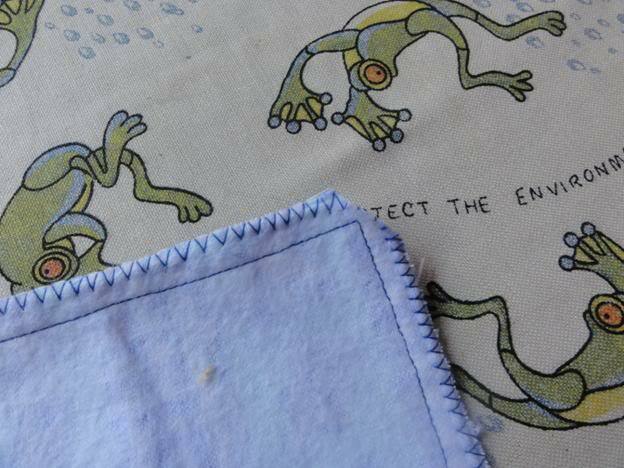 The sewn edge of the front piece will extend past the back piece. Fold this over the back. Pin all around the pillow case edge, except for the folded edge. 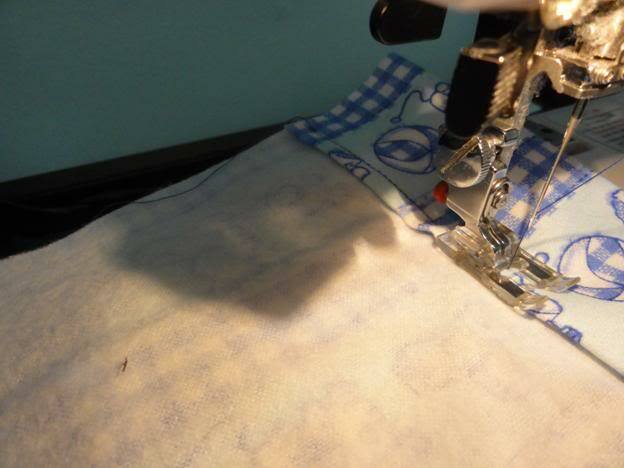 Sew a 1 cm seam around the three pinned edges, of the diagram above. Start at the lower right corner, don’t forget to lock your seam, then stitch until you get to 1 cm from the lower left corner. At this point, stop with the needle still in the fabric. Lift the presser foot and rotate the material so you can continue down the short side. Don’t forget to lower the presser foot before you start to sew! Continue in this manner, till you've gone fully around the three pinned sides. Lock off your seam with a couple of reverse stitches. You’re almost finished. Check carefully for any stray pins – we don’t want any unpleasant surprises. Trim any stray threads. 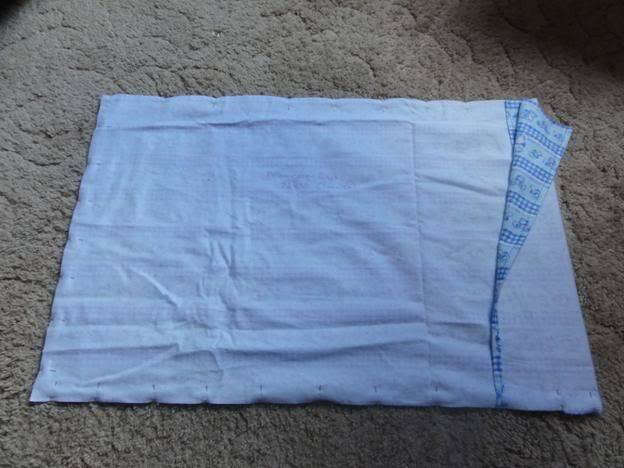 With the pillowcase still inside out, iron all around the seams. This will set the stitching and make it all look nice. 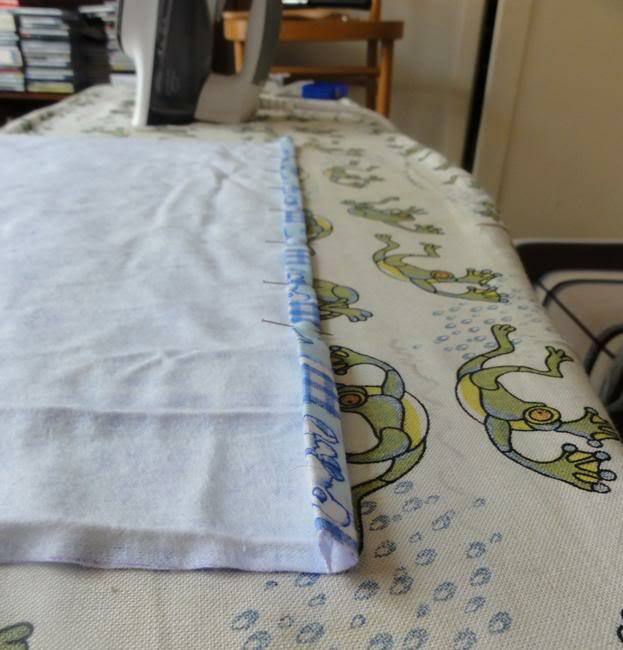 Now turn your pillowcase right-way out, carefully pushing the seams out to the edge. Press the pillowcase flat. You are finished, unless you want to sew in a cute little label. These look very cute – something similar should be available from your fabric shop. They make a nice touch if you are giving the pillowcase away as a present.